DocuSign, a major provider of electronic signature technology, acknowledged today that a series of recent malware phishing attacks targeting its customers and users was the result of a data breach at one of its computer systems. The company stresses that the data stolen was limited to customer and user email addresses, but the incident is especially dangerous because it allows attackers to target users who may already be expecting to click on links in emails from DocuSign. 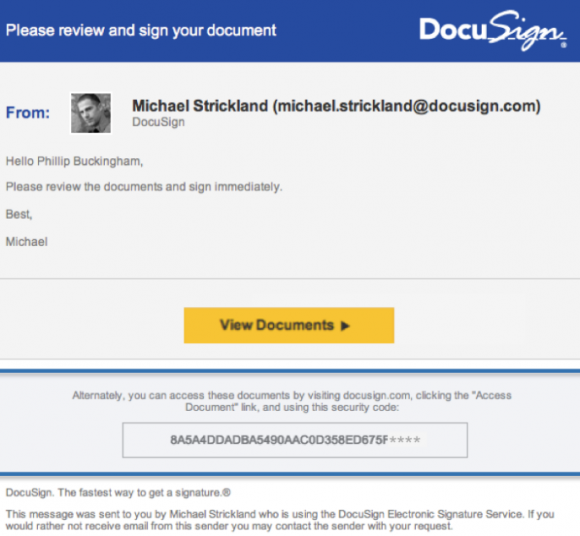 San Francisco-based DocuSign warned on May 9 that it was tracking a malicious email campaign where the subject line reads, “Completed: docusign.com – Wire Transfer Instructions for recipient-name Document Ready for Signature.” The missives contained a link to a downloadable Microsoft Word document that harbored malware. A typical DocuSign email. Image: DocuSign. The company said at the time that the messages were not associated with DocuSign, and that they were sent from a malicious third-party using DocuSign branding in the headers and body of the email. But in an update late Monday, DocuSign confirmed that this malicious third party was able to send the messages to customers and users because it had broken in and stolen DocuSign’s list of customers and users.